Usually I don't like to say too much about the actual purchasing of books. I really don't lead you out to this site as a sales ploy. Of course I hope you read my work, but it's not all about the dollars and cents of what you buy. But for several days I've been noticing what seems like a great deal to me, and I'm thinking some of my US readers might want it drawn to their attention. 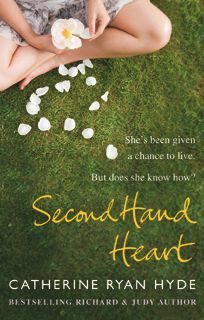 If you go to this page at The Book Depository, you'll see that they're selling pre-order copies of my new UK novel Second Hand Heart for $5.24. $5.24! It's marked 49% off. Granted, it's a paperback edition, but it's a big, nice trade paperback, high quality, not like a mass market edition. And they offer free international shipping! Maybe more important even than the price is that there doesn't need to be a wall between my US and UK readers. UK readers, you'll notice that if you go to this page on Amazon.co.uk or this page at The Book Depository, you can pre-order my new US young adult title Jumpstart the World (you so don't have to be a young adult--it so crosses over), also at a discount. So the ocean is shrinking, and the body of work is the body of work, without defined borders. Yea. When I first published When I Found You in the UK only (for now at least), the big question from US readers was, "When will it be released in the US?" I'd like to change the question to the more useful, "Where can I get a copy easily and for a great price?" So that's why I thought a blog entry on the subject might be useful. If any of you reading this know of other good outlets for international book shopping, please let me know. I heard about The Book Depository from a reader, in response to a blog post. So this interactivity continues to be a great thing all around.